This set is adorable! The yellow little checkered cab 's license plate says COOKIE, and the other shaker is a stop light. Made of hand decorated glazed ceramic. 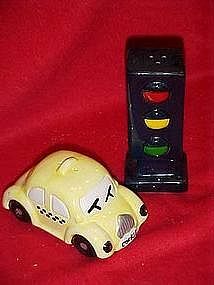 The stop light measures 4 1/4" tall, and the car is almost 4" long. Both have their plastic stoppers. Perfect like new condition.